Freshman Rep. Alexandria Ocasio-Cortez, D-N.Y., already has developed a reputation for outlandish statements, such as warning that the world will end in 12 years. She often has commented on social media, enjoying the First Amendment that protects her freedom of expression. But she apparently doesn’t think others should have the same right, abruptly blocking one of her political critics. The problem? President Trump did virtually the same thing and the Democrats sued, with a judge ruling the social-media accounts of elected officials are a “public forum” from which Americans cannot be banned. So Cortez is being told, via Twitter, to apologize and unblock. A Federal judge ruled that Trump’s blocking his critics on Twitter violates the 1st Amd. & is unconstitutional, bcz Trump’s Twitter Acc is a public forum operated by the gov & discrimination is strictly prohibited. BizPacReview reported Cortez blocked Ryan Saavedra, a conservative reporter from the Daily Wire who had criticized her “race-baiting stunt” at Al Sharpton’s National Action Network’s annual convention. “While Saavedra found it to be a laughing matter – and not unjustifiably so – some believe that AOC may have inadvertently just broken the law by violating a judicial precedent,” the report said. The judge found the Twitter account was a “public forum,” and restricting participation based on political speech was viewpoint discrimination that violates the First Amendment. She also drew attention for a history flub. She said Republicans changed the Constitution to prevent President Franklin Delano Roosevelt from being re-elected. In fact, he had been dead two years when Congress approved the amendment in 1947. It was ratified by the states in 1951. She also, during a recent congressional hearing, demanded that Wells Fargo CEO Timothy Sloan explain why his company was involved in caging children. He patiently explained the company wasn’t engaged in any such activity. 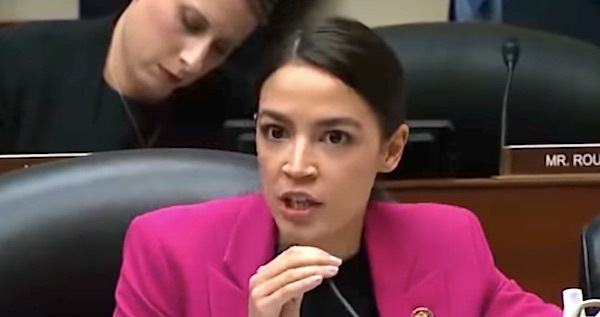 The post AOC told to apologize after censoring political critic appeared first on WND.